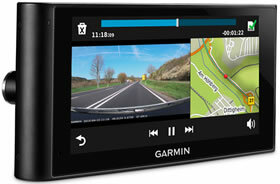 Garmin dezlCam LMT-D is a truck satellite navigation system and a dashboard camera (dash cam). Featuring a 6-inch touchscreen, lifetime maps for Full European coverage the dezlCam also includes free digital traffic information without subscription. You can also enter your trucks profile into this Garmin truck sat nav and it will route you along appropriate roads for your vehicles size, load type, weight limit, etc. The dash cam will record in Full HD continuously capturing events in the road ahead. There is also a G-Sensor for automatic saving of video. Bluetooth connectivity also allows you to connect the satnav to a smartphone to make and receive handsfree calls using the dezlCams built-in speaker and microphone. Garmin dezlCam LMT-D has been discontinued. Accessories, spares and parts are still available for your dezlCam LMT-D as are street-level road maps. 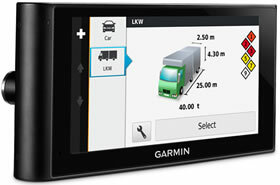 Garmin dezlCam LMT-D is a truck satnav and dash cam all-in-one. The 6 inch touchscreen on the dezl cam provides a large display for navigating plus you can instantly playback video recorded on the dezl dash cam. Lifetime European maps and traffic are included with the dezlCam LMT-D. Simply enter your trucks dimensions, weight and type of load in to the dezl Cam LMT-D and you will be routed along appropriate roads for your truck. You can even swap trailer sizes at the touch of a button. Further information provided by the dezl cam is bridge heights, weight limits, sharp curves, steep gradients, high wind areas, grounding risks and road restrictions. The Digital Traffic service will tell you minutes of delay, possible detours and help to ensure you are driving along the fastest, shortest route for your journey. On screen information includes the navigation screen, your speed, the speed limit for almost every major road, current street being travelled on and expected arrival time. The dashboard camera provided with the dezlCam LMT-D will record in HD continuously capturing events as they happen in the road ahead helping you to prove who was at fault if you are involved in an incident. Video is recorded in a loop, overwriting old video when the SD card becomes full. You can save video to protect it from being overwritten by manually pressing a button or the built-in G-Sensor will save video automatically if an G-force is detected from an impact. Furthermore the dezl Cam has a built-in battery so you can detach the dashboard camera and use it as a dash cam to take photos using the Snap shot camera feature. The trip planner allows you to plan your route before you travel. You can also enter multiple stops within the same journey as well as save multiple journeys. 1. Download speed camera database directly from Garmin for £16.99 for a year (UK and Ireland) or £25.99 for a year (Europe). Updates are available every 2 weeks to download from a PC computer to your dezlCam. 2. Use a smartphone to get speed camera database. There is a one-off charge of £16.95 for life and the app streams speed camera locations database to your Garmin dezlCam. Bluetooth will syncronise the Garmin nuviCam with your smartphone then you can use the speaker and microphone on your Garmin nuviCam to make and receive handsfree calls. Furthermore, when connected to your smartphone, you can use premium data services and get additional real-time information such as such the weather radar and live-road-traffic-cameras images by using the Garmin Link App. Up Ahead feature suggests POIs along your route and Easy Route Shaping allows you to choose particular roads and places to visit along you route which you can incorporate in to your journey. Optional GPS capabilities can record location, speed, date and time when an incident occurs. An 8GB microSD Card is included in the box with the dezl Cam LMT-D. The nuvi cam can accept SD Cards of size up to 64GB. An adjustable swivel lens is also included which will work with the windscreen or dashboard mount. The Garmin clock will change the time zone automatically and sunrise and sunset times are included within the Garmin dezl. 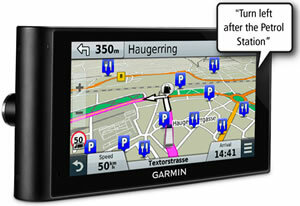 Country borders will also show up on the Garmin sat nav device. The Garmin dezlCam LMT-D includes everything you need to mount and install it in your trucks cab. Included when you purchase from ActiveGPS is a windscreen suction cup mount which is magnetic to make installing and dismounting your dezlCam simple, quick and easy. The most popular place to locate the satnav is at the bottom, middle of the windscreen where you can see the satnav easiest. Plus the satnavs dash cam will have a good view of the road ahead. We do not recommend using a third party charger with this product. A mobile phone USB charger or a laptop may not be powerful enough to reliably charge the Garmin dezlCamLMT-D and may provide an incorrect voltage or insufficient power. An official genuine Garmin AC charger is available for indoor use with this product you can view and buy here. 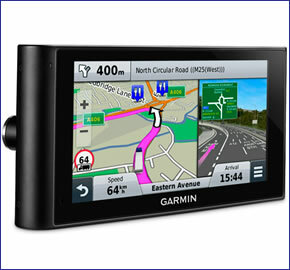 Garmin dezlCam LMT-D is preloaded with City Navigator NT for the UK, Ireland, Western and Eastern Europe provided by here maps. These maps can be updated FREE for the life of the product, when you register your dezlCam with Garmin UK. Further Garmin dezlCam maps are available on SD card which insert directly into the Garmin dezlCam. Available Garmin dezlCam maps include North America, Australia and New Zealand, Middle East and Southeast Asia. Click here. The Garmin dezlCam LMT-D includes all the accessories you need to get you up and running. 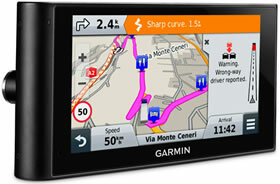 The Garmin dezlCam is preloaded with street-level road maps for all of Europe. If however, you want to take the dezl Cam further afield, we may have the map that you need. Garmin City Navigator maps available include: USA, Canada and Mexico, Australia and New Zealand, Morocco and Southern Africa. Question: I want to order a dezlcam lmt-d, can I just check is there any difference apart from the dash cam to the dezl 770 and is it as good as dezl 770 please? Answer: To compare the Garmin dezlcam LMT-D and dezl 770LMT-D please see our online comparison table. Do you have a question about the Garmin dezlCam? Submit your question via our contact page.